CAFU: The atmosphere will change once Brazil kick off against Croatia in Sao Paulo on Thursday. SAO PAULO: Brazilian former World Cup-winning captain Cafu insists his protesting countryman will soon get into the right spirit once the World Cup kicks off on Thursday. Brazilians are enduring tough times, with metro strikes bringing commuter misery to Sao Paulo amid protests at the mammoth cost of the World Cup. 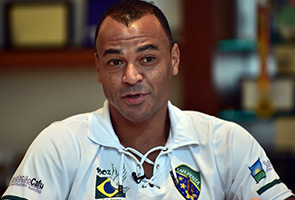 But the people will get into celebration mode once the event begins, Cafu insisted Saturday. "The political situation is boiling over - and I wish the talk could be of football. But that's currently not possible given all the political arguments," 2002 World Cup-winning skipper Cafu said on the day he turned 44. He believes, however, that the atmosphere will change once Brazil kick off against Croatia in Sao Paulo on Thursday. "There are strikes all around the world and in general this has nothing to do with the World Cup. "This is a moment that the people feel they can make their voices heard most clearly in the Cup foreground," the only man to have appeared in three World Cup finals told German sports news agency and AFP subsidiary SID. "We are currently going through tough times as a country. That is why there is no great joy coursing through in the run-up to the event. "But once it gets going, you will see a totally different Brazil," Cafu forecast, insisting the celebrations would then begin to take hold. He stressed that he backed the protests as long as they were not violent. At the same time, he feared they could be even larger than those which marred last year's Confederations Cup "as this is a bigger event" with even more attention focused on the host nation.